Beautiful lakefront home located on the Winter Harbor section of Lake Winnipesaukee. Private 1 acre wooded lot. Large dock, lakeside deck. Sleeps 8 comfortably with three bedrooms, 2 full baths, living/dining room, screened in porch, full kitchen with up to date appliances. Only 3 miles from downtown Wolfeboro. Close by attractions include boating, golf, hiking, dining. This house is a perfect blend of classic and contemporary. The original natural pine paneling can be found through out the house. We have recently remodeled the 2 full bathrooms and have upgraded the kitchen appliances. You can view the lake from virtually every room in the house and the house is less than 100' from the shore. The house is on a point of land with 500' of shore front which provides a quiet setting for your vacation. We are at the end of a private road, 1/2 mile from the main road which minimizes traffic noise. Plenty of parking in the driveway, easily handle 4 cars in front of the house and there is space to park a boat trailer across from the garage. Large dock, can accomodate up to a 26' boat. Lakeside deck that provides wonderful sunset views.. Downtown Wolfeboro is 3 miles away where there are many dining options, 2 grocery stores, pharmacy and many great small retail shops. There is a large public dock(s) on Lake Winnipesaukee making Wolfeboro very accessible by boat. Wolfeboro also has a hospital in case you need medical attention. Side by side with outside door mounted ice/water dispenser. Small loaner library in living room. 3 season porch with TV, futon, several chairs. Great views of the lake. Cable TV, DVD, WiFi, large lakeside deck, 34' dock with swimming area. The weather was absolutely perfect, the house has so much room to move around in with great views of the water from just about every window and all of the amenities of home. With 2 docks to just sit and relax and enjoy all the boats on the water as well as for swimming and boating. We just absolutely love this place!! This being our first time renting a home, we were not sure what to expect. As soon as you turn on the street, you know its going to be peaceful and private. This house has everything you need with a great deck over the water and a seperate dock a little further down. 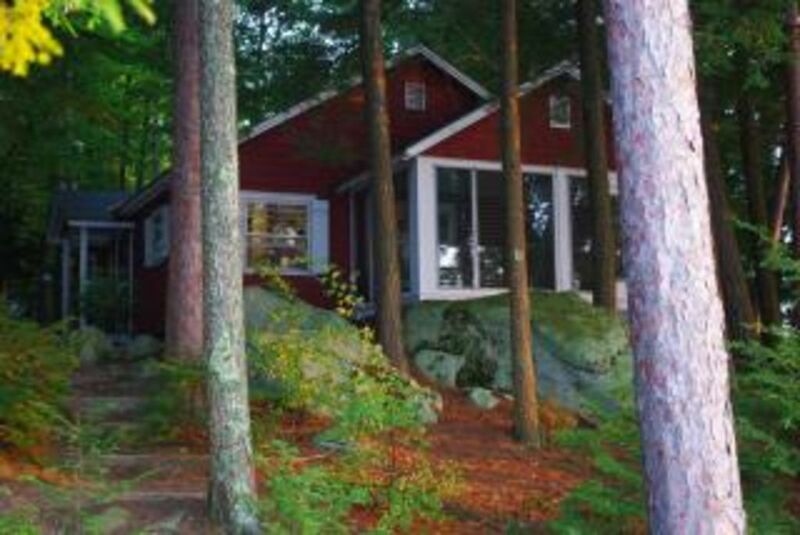 It is a little wooded which is nice as you get to enjoy the variety of birds and little chipmunks. There are these unique huge boulders around the property to sit on and enjoy the peacefulness. We loved the interior wood as all the doors felt like castle doors because of their handles and the thickness of the doors. We caught fish all day long and there is a great ladder on the dock to go into the crisp clean water and be able to swim to their private raft. There was the perfect amount of sun and shade for everyone to enjoy the outdoors. Owners are wonderful to work with and proud of this house that their grandfather built. We will be renting this home again! Local activities include swimming, boating, golf, hiking, dining, amusements.